Creative imagination, fearless attacks and brilliant sacrifices. Alexei Shirov displayed all of the qualities of his countryman and teacher, Mikhail Tal. Not afraid to jump into a difficult, complicated situation, Shirov was at home with chaos on the chessboard. Playing against the most elite players in the world, he rose above them and challenged for the World Championship. Always an interesting player to study, his games have dazzled players for years. 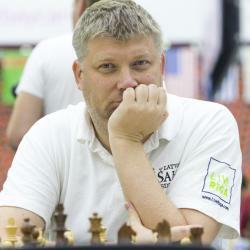 Alexei Shirov was born in Latvia and became an International Master in 1989 at the age of 17 then a Grandmaster in 1990 at the age of 18. He has won multiple international tournaments throughout the years. By the year 1998, Shirov had risen to his highest ranking ever, number 4 in the world, and was invited to play in a match against Vladimir Kramnik. The winner of this match would play against Garry Kasparov for the title of World Champion. Shirov defeated Kramnik but the plans to play against Kasparov never ended up working out and the match was cancelled. Two years later, in 2000, Shirov got his first real chance at the World Championship when he played Viswanathan Anand. He ended up losing this match 3.5-0.5. Shirov’s style of play is reminiscent of his fellow countryman and teacher Mikhail Tal, always attacking and looking for complications. Also an accomplished author, writing the “Fire on Board” books, Shirov continues to be a strong chess player, staying in the top 50 players in the world.